Why Businesses Should Invest in Web Design? For business owners. Home Tech Why Businesses Should Invest in Web Design? Why Businesses Should Invest in Web Design? Today, every business should have a web presence. We discuss why you should invest in web design. It is important to invest in web design. After all, a website says a lot about your business when your competitors are also fighting to be in the limelight online. To cast your brand in the best possible light, you need to have a good web design. And by good web design, we refer to websites that provide consumers with a good user experience. In today’s market, consumers tend to search for businesses online. In fact, a business website is sometimes the first sales touch point that consumers have with a brand. If you look at it this way, an online presence is not just any marketing channel. It is possibly the starting point to creating brand awareness and influencing your consumers to make a buying decision. And given that your business website is available 24/7 to a global audience, it is an important channel to connect with consumers. But how important is it to invest in quality websites, you might ask. 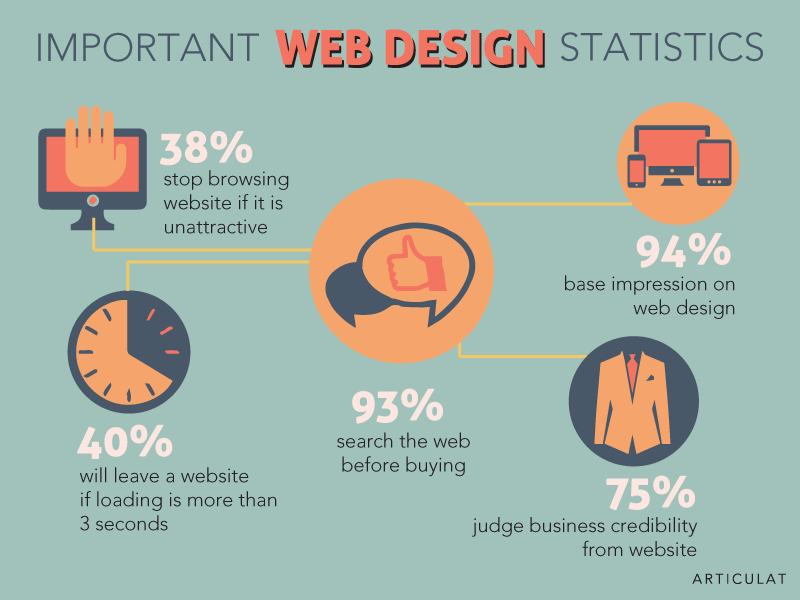 The following are key statistics based on researches and surveys to substantiate the importance of paying attention to your website. Today’s consumers like to browse online before making a buying decision. This means visiting the company website to find out more about the business and its range of products and services. It is common for them to read online reviews to find out another consumer’s first-hand experience with the company’s products or services. Imagine what consumers would feel when they see a lacklustre company website. This brings us to our next point. Consumers form an impression of a brand 0.05 seconds after a website loads. This means that consumers have an opinion about your brand almost instantaneously. And this opinion will determine if they stay or leave the page. If a consumer leaves the page because he or she is not impressed with the page, this consumer will never get to learn about how good your product or service is. And it is unlikely that he or she will ever return to your website. In fact, this consumer will most probably turn to your competitors for solutions. So what makes a website unattractive? It could be anything from boring fonts, plain images, poor alignment or a distasteful colour palette. Given that today’s consumers are bombarded with loads of information, they can no longer tolerate waiting. And every second counts. If a website takes longer than 3 seconds to load, visitors will not hesitate to look up a competitor for similar products or services. According to Kissmetrics, a 1-second delay in loading time results in a drop of consumer satisfaction by approximately 16%. And this delay also results in 7% drop in sales conversion. Furthermore, 79% of online consumers are more likely to discontinue buying from a website if they find the web performance unsatisfactory. While businesses try to accommodate more content, better aesthetics, and greater functionality, it cannot be at the expense of a longer waiting time. Page loading time affects a website’s user experience. A good user experience leads to higher brand and sales conversion. Not only is a long waiting time a showstopper for web visitors, it also affects search engine rankings. Google, for instance, ranks site speed as a factor. A website’s look and feel contribute to a visitor’s first impression of it. This is based on a research conducted at Northumbria and Sheffield University. The research revealed that consumers made their first impression based on design-related factors such as the website’s layout, colour palette, navigation and font size. Not surprisingly, a visually engaging website creates a positive brand image. The opposite is true of an unattractive website. This finding is based on a research by Stanford. To gain the trust of consumers, websites must display a professional and authoritative image. Your website should set you apart from the competition and convince consumers that you have a solution for their problem. An attractive web design that provides a good user experience instantly instils confidence in consumers. Apart from its visual appeal, websites must also be functional. Broken links on a website can instantly diminish consumer confidence. Ideally, your website should establish your credibility as a solution provider. There are many sales touch points at a consumer’s disposal. And a website is one that businesses cannot afford to neglect. If done right, a website is a channel that can improve a consumer’s buying journey, develop richer engagements, and build brand loyalty. If all it takes is better designs and functionality, businesses should not hesitate to invest in it. Articulat Private Limited is a web and graphic design firm. We are a team of dedicated creatives who can create engaging content, stunning graphics and unrivalled web designs. SME Internet Marketing: How to Get Started?